JungleWatch: YOUR WORDS ARE POISON! Through rain or shine, or even no sign, we continue to protest against the evil that has been allowed to fester on our island. This includes the on going battle to regain our Archdiocese even when the Neocatechumenal head catechist on Guam, Pius, allows this to be published on the "Insider's View:"
Like Grima Wormtongue, Pius "whispers" rumors and untruths in an attempt to divide this island's faithful even further. 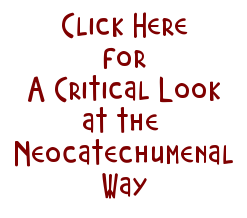 Through his other loyal catechists and responsibles, they have been sowing the seeds of discontent because they need a sickly environment in order to take over. Look what they did to Barrigada, to Agat, to Chalan Pago, to the Cathedral. 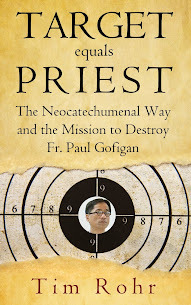 Through the direction of the off island ncw cabal, Pius and his cohorts put on a facade in these "invitations" all the while dividing our parishes, our families and even our clergy to the brink by undermining the narrative. Our "Theoden" became as sickly through the manipulations, and though his initial bad seed was planted long before the neo infected our island, they razed his land till it was barren. (Which is why Apuron is hiding out in Cali instead of in some lavish guest room in New Jersey - they just don't seem to have a need for him anymore). What Pius and his heralds cannot seem to grasp is that while they rely on their forked tongues, anonymous bloggers and no name comments, we have documents, testimony, and real people using their real names - the truth. While they are busy rabble rousing, our protest is founded on real issues, chronicled events and numerous victims who decided they weren't going to take it any longer. Neither are we. So until our Archdiocese is free of the RMS, free of Pius and free of manipulating clerics, we will continue to be in front of the Cathedral Basilica peacefully and prayerfully protesting every Sunday morning; just like this Sunday. For more pictures of courageous Catholics, click here. We were not afraid to walk the distance and it was not like being led to slaughter. It was more about giving sacrifice under the circumstance. The rain went a long way to soothe fears and wash away tears. We did not get sick from it. We did it for the love of the one true church. Its surprising that Pius and the Dianas perceive that these manamko's are being led to slaughter, but failed to understand that out of their free choice with perfect understanding and purpose are giving of them selves for the Love of their Church and the truth. The NCW on the other hand are the ones led by their Catechist and cunning men like Pius who are not free to decide for themselves, and are following leaders who are self serving and for reasons of monetary gain, the blind leading the blind. So far the truth has been vindicated by the grace of God through the fruits of these manamko's labor. What fruits has Pius or Diana have to show, but the lies that they propagate. Keep up the fight. We need to clean up our Church. We need to support Byrnes and others that are there now to do the cleaning. Byrnes is learning fast. He now knows friend versus foe of the AOA. For many if not all of us on the picket line, the 'lambs' were the innocent children harmed by Anthony Apuron who posed as a 'shepherd' when he really is a wolf in sheep's clothing. No amount of prayers will reverse the harm he has caused, but laicizing Apuron will go a long way in demonstrating to his victims and all of the faithful and general public that our Church can do the right thing. For as long as we can, we walk and pray for Rome to defrock Apuron. Has Pius made any appearances this weekend? Diana said Fr Pius said he's here to stay. Not helpful. How about Lurch sightings . Heard he's back. Fervent as ever. He is doing catechesis in agat every Monday and Thursday at 700pm but lately he disappeared and fr. Krzysztof was there. Hmmm. Fr Krzysztof? Placeholder or new Lead Catechist? Just wondering. Where's his best bud Edi? Will CAB Byrnes severely limit wearing Roman collar for Deacons in Archdiocese as Apurun did? So many concerns from Dear AnonymousFebruary 20, 2017 at 11:40 AM ? Don't forget nothing or nobody can erase the fact that Arch. Byrnes had walked the protest "Through rain or shine, or even NO SIGN". I dare you to ask Arch. Byrnes for yourself if he's being used and deceived. C'mon, I double dare you? Perhaps we could increase attendance at the Sunday protest if each of us asked our own individual family members to join us at least one Sunday. Just one Sunday. Make it a family activity. Perhaps a family get-together, all generations, starting with the picket and then a family pot-luck lunch afterwards. Who knows, maybe some of our own family members are just waiting to be asked directly by those of us who actually are involved in the picket line.